The one commonly used way to practice speaking skills – that you DO NOT want to use. A trick about SOUNDBITES that will help you avoid mistakes that can get you misunderstood or prevent you from getting your message across. If you act fast, you can get free access to his comprehensive online media training course by clicking here. TJ Walker is one of the best media training experts in the world. Through his company, Media Training Worldwide, he helps public figures such as Olympic and pro athletes, presidents and prime ministers and even Miss Universes communicate more effectively, so that they can answer questions and so they can get the exact quotes they want, regardless of whether the reporter likes them or doesn’t like them, is nice and sympathetic, or mean or stupid. He teaches how to have a clear message and speak so that your message is understood whether in the media, public speaking or simply how to present yourself so that you grab the attention of the people listening. If you wish to get notified about a live workshop that we will be proposing in Sarasota or New York, with actual personal media training, send me an email and let me know you are interested. You can learn to feel more professional in presentations and interviews and to be great on TV – did you know that? Do you want to know how to come across your best ? Well if so I made a scoop for you! from one of the best media training experts in the world – founder of Media Training Worldwide – TJ Walker. We will talk about some simple things you can do to improve your interview skills that TJ has used to help public figures such as athletes, presidents and prime ministers and even Miss Universes communicate more effectively. – The one commonly used way to practice speaking skills – that you DO NOT want to use. As well as a trick that will help you avoid mistakes that can get you misunderstood or prevent you from getting your message across. I’m super proud of this interview because – to be honest, interviewing one of the best media training experts in the world is a little intimidating – and very audacious on my part ! But I really wanted you to get access to this info. Even just studying the actual way that TJ answers my questions to get his own message across, is a great lesson in itself. So listen to his tips – and then re-listen and see how actually he practices what he preaches in this very interview for an excellent example of how it’s done. 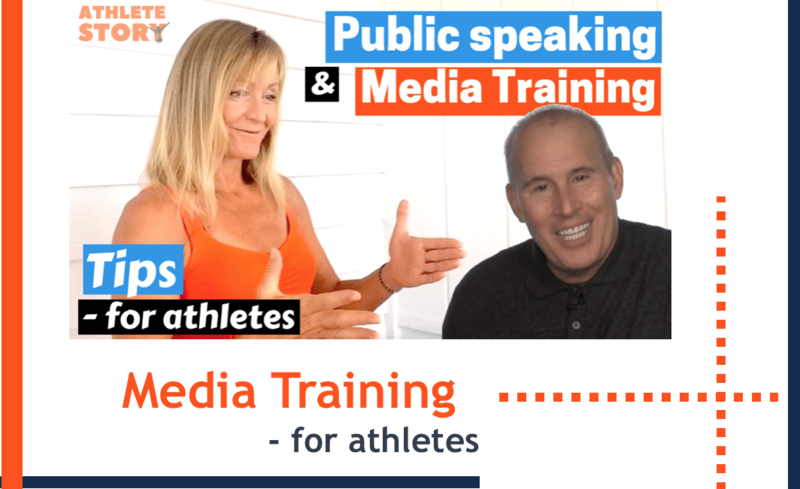 If you’d be interested in more media training specifically tailored for athletes and where you can get personal media training and feedback – reach out and I will let you know when we set up the next live media training program for athletes, coaches and entourage. But now, enjoy the interview. Welcome to TJ Walker. Anja: Hi, TJ. Thank you so much for being willing to accept my invitation to be on Athlete Story. I’m so honored to have you here. TJ: Good to be with you. Anja: Thank you. I was wondering if we could play a little game here. I’m going to ask you to introduce yourself because that’s a thing that’s hard for people. [chuckles] Maybe you can give an example of how to do it and how not to do it? TJ: I teach professional athletes and Olympic athletes how to communicate more effectively, especially to the media and also team owners and others involved with professional and high-level sports because they all come to me and they want the same thing. They want to look comfortable, confident, relaxed. They want to speak so that their message is understood, that they have a clear message, that they can answer questions and so they can get the exact quotes they want, regardless of whether the reporter likes them or doesn’t like them, is nice and sympathetic, or mean or stupid. Okay, so let’s back up. What did I do there with my introduction? I tried to tailor it specifically to your audience. Your audience is athletes, I’m assuming. TJ: Reality is, I work with presidents of countries, and the prime ministers, and Nobel prize winners, and bureaucrats, and mutual fund managers. I work in every single industry. If I just come out and say, “Well, I’m this big shot and I work with everyone,” it’s not interesting to people. I try to tailor my introduction to the needs of the audience. I don’t want to launch into a sales fit because nobody trusts me or knows me yet. Access to a free online media training course, what’s the risk there? I’m trying to wet people’s appetite to listen a little more. Even if they don’t, to that check out your website or the notes for your podcast and click on it to get the access to that course. That’s my agenda. Anja: If I get this right, the idea is to show why I- if it’s me, why I am relevant to you, the listener? TJ: Yes, why should that listener or viewer or audience member care at all about you. Why should they want to even pay attention? Because attention is the real resource people value these days because they could have a podcast on and yet, they still want to check e-mail and text and things like that. They’re only half listening. They’re a quarter listening. I want to grab their attention. I don’t want to waste time saying, “Well, I founded media training worldwide in 1985.” I don’t want to give them boring facts and talking about me, me, me, me. I want to talk about me only in the context of how we can help them and someone like them that they can relate to. That’s what I try to do in introductions. That’s what I believe is the best way you can introduce yourself in any situation. Anja: Very good. Say you’re an athlete and you’re being asked to do a public speaking gig or a presentation at your club or whatever and you have to tell a bit of your story. That’s what they expect from you. You would try to make that story relevant to them and not think too much inside of yourself. Is that what you’re saying? TJ: Well, the beauty of sport is, human beings around the world love sport. It’s much easier to be interesting as a speaker talking about great athletic moments than just about public policy or environmental policy or running for political office. In that sense, it’s easier. If you recap certain trials and tribulations you had and setbacks and defeats and near defeats and what happened, especially with your team members, that’s going to be interesting to your audience. The key is trying to figure out what is a message they can relate to. If you are Michael Phelps and you have this super odd a body where your torso is three times longer than your legs and your legs or your feet bend, becoming great, in part, is genetic. In part, it’s the hard work. In his case, overcoming the psychological problems which he’s talked about freely and openly with others. People can relate to that. They can’t relate to having a body that’s just built for a particular sport. Don’t spend as much time on that, even though that may be a huge factor in your success. TJ: For a long, long time, every little boy in the world and, increasingly, a lot of little girls dream of growing up to be either a professional athlete or an Olympic athlete. If you do have high-level athletic skill– For the record, I should point out I have no athletic skill [laughs] whatsoever. If you have high athletic skill and some level of achievement, people are inherently interested in that. Now, the problem a lot of athletes have is, just by showing up, a lot of people get excited. They can get lazy. After a game and their interview, they’ll just say things like, “Oh well, we played really hard today,” and a bunch of clichés. It’s boring. When you look at professional athletes who make the most money in their career, the vast majority of them make more money by speaking as a network commentator, as an interviewer, as a host, as a celebrity spokesperson than they do actual winnings. Certainly, that’s the revenue model for all Olympic athletes, is you want to be the person who gets to the chase, the multilevel or the multinational bank to give you that $10 million sponsorship deal, where you’re in the commercials and you’re not just swimming, or the sport you’re doing, but you’re actually speaking. Tiger Woods has actually made a lot more money as a spokesperson for companies like Buick than he ever has from the prize winnings of tournaments. Anja: I hope you’re listening here, guys, because this is really valuable. It’s not always about how many followers you have or about the prize money in your sport. It’s also about being something more than your sport. TJ: If you can talk about not just your particular sport but how you overcame adversity, how you perform when the chips were down, how you took members of a team who individually didn’t have any more talent than any other team and you brought them together in a way where you triumph over adversaries. Those are messages, frankly, that corporations love, and trade associations. There are a gazillion ways to make money from that as a speaker, as a keynote speaker, as a workshop leader. Those are also the traits a lot of TV networks look for when they are looking to hire analysts, whether it is just for a special event tournament or the Olympics or regular hosting positions for sports programming. It’s never too early to learn how to communicate more effectively on camera and to be interesting. How many times have we seen athletes who are great athletes but after the interview, every other word is “and,” “um,” “you know,” and, “We played good today, you know,” and, “Everyone put in 110% you know.” It’s painful to listen to. Now they become great athletes because most athletes spend eight, 10, 12 hours a day for years, sometimes decades, learning their craft. The good news is, you don’t have to spend eight or 10 hours a day for decades or years or months or even weeks to be great when it comes to speaking to the media and giving presentations. The very same tools can be used. These days, most high-level athletes have themselves video recorded so they can watch what works, what didn’t work. Where did you make a mistake? Where did you have that peak performance? Exactly the same thing can be done for speeches, presentations, media interviews, hosting opportunities. That’s what I’ve done my whole career in coaching athletes and other executives on how to communicate more effectively, whether they’re giving speeches or meeting interviews, is I videotape them, typically a dozen times in one day. We play it back. We figure out what works, what doesn’t work. That’s what so many coaches do, whether you’re playing basketball or hockey or skiing, is a coach will analyze the videotape. Oftentimes, it’s not pointing out the mistake as much as, “Here’s what you did really well. Let’s do more of that.” That’s what I do when I’m working one-on-one with clients all over the world and in group settings. Whether I’m working with the US Olympic ice skating team executives or professional sports executives, that’s what I do. I practice with them on video again and again. Anja: Excellent. That’s a big thing as well. You can practice this. You don’t have to be born with long arms and limbs or [laughs] blonde hair or whatever. You can practice. With practice comes skills, as we know with athletes. TJ: Well, it depends on how you practice. I can practice 12 hours a day playing golf but if I’m holding the wrong end of the club, I’m never going to shoot par. I’m never even going to break a hundred. [chuckles] It’s not just practice, it is how you practice. A lot of people practice their speeches, their presentations the wrong way. For example, looking in a mirror is a horrible waste of time. When you look in a mirror, you can’t actually focus on speaking. You’re focused on things like, “Uh oh, I’m losing my hair,” and, “Is there a dent in my nose?” and, “My eyes are kind of big.” Don’t practice in the mirror. When you practice, practice and have it recorded. You can use your cell phone these days, an iPad, a webcam and just focus on speaking. Then watch it and focus on what you’re doing well so you can do more of it. Don’t obsess over any one little mistake. TJ: Soundbites. If you’re being interviewed after a game and– The interview might go on for 10, 20, 30 minutes but you may only get 10 seconds on ESPN or some other major sports network or local sports network. If you talk for 20 minutes and you get 10 seconds on, it means that 19 minutes and 50 seconds of what you said was cut out and thrown on the floor. Only 10 seconds gets on. What makes that 10 seconds get on and the other stuff not used? That’s because it’s a soundbite. It’s a bite out of your sound. Now in my online course which, again, I’m going to offer to your first 100 viewers at absolutely no charge, I outline for you the 10 soundbite patterns. All quotes, whether it’s from sports, whether it’s TV, radio, or print come from 10 speech patterns. It’s either an absolute, an emotion, a cliché, an attack. There’s 10 of them. I walk you through those. That’s why if you say nothing but positive things about your coach and your teammates for 20 minutes, and then in the last 10 seconds of walking out the door you say, “Yes, coach made a stupid decision putting in Smith for Johnson,” boom. That’s the only quote that’s going to be used. Why? Because it’s an attack. You said your coach made a stupid mistake. You call something or someone stupid. You say someone made a mistake. That’s an attack. It doesn’t matter if the reporter loves you or hates you. They’re going to use that. If you don’t want to be quoted, calling your coach stupid for making a stupid mistake, don’t say it. TJ: Many times, especially after success in sports, you’re going to be asked to give speeches, sometimes earlier in your career- maybe free speeches at local civic groups, colleges. Over time, you’ll increasingly have opportunities to give paid speeches at corporations, trade associations, other events. Several quick tips. Number one, narrow your messages down to a handful or fewer. Don’t try to tell people everything you learned in your whole career of sports. Narrow it down to just a handful. The next tip, have an interesting story for each point. The next step, practice on video until you like it. If you see a video of yourself speaking and you think, “Wow, that’s really boring and doesn’t make sense,” guess what? It is boring. [chuckles] Don’t use it. Don’t give that speech until you are prepared. By the way, this is the number one way to get rid of nerves and being uncomfortable and nervous before a speech. We’re nervous because we think we might we might bomb. We might be horrible. We might be boring. Well, guess what? You might be boring. The way to solve that nervousness is to actually practice on video until you like it. You’ve seen a million boring speakers in your life. Everyone watching this has seen boring speakers. You already know what doesn’t work. That’s why you need to practice it until you like it. When people come to me for private training, they think I’m going to be telling them, “Here is 72 things you did wrong. You get a C or a D for today, or a B.” I always tell them, I said, “The harshest judge today, the ultimate grader of today, is not me, it’s you.” You’re not ready to give a speech until you have personally seen a video of yourself and you love it. TJ: Sure. The biggest tip is, the second you tell yourself you’re annoyed or that’s a stupid question or a boring question, you’ve already screwed up. Nobody cares about your opinion of the questions. You need to look at it simply as an opportunity to say what you want. I don’t mean dodge the question. I do mean, answer it on your terms. If you hear a question that you think is stupid, then rewrite the question to make it an interesting question. If you think that the question is boring, rewrite it to make it an interesting question. That’s the real skill at this. You’re not being judged on the questions that’s being asked. You’re being judged on how do you come across, what are your ideas. You don’t ever want an interview to somehow depend on the type of questions the reporter is going to ask. You don’t go into a game or an athletic event saying, “I’m only going to perform well if my competitors do things a certain way.” Are you? You got a strategy- regardless if it’s an individual sport or a team sport- how you come across your best, how you execute what you want to do. I take the exact same strategy when it comes to dealing with the media. For example, sometimes when I go to a foreign country and I work with a political leader, a president or a prime minister, political reporters will come to me and say, “TJ, don’t you feel guilty and ashamed about teaching people how to tell lies and obfuscate and bend the truth?” That sounds like a tough question, right? How do I answer that question? Well, I can’t answer the question until I have rewritten it in my own brain. I’m not going to dodge the question because that makes reporters hate you. The reporters are asking me about teaching people to lie. I don’t teach people to lie, but I don’t want to say I don’t teach people to lie because that makes me look defensive. It also sounds like what a professional lying teacher would say. I don’t want to tell people that I don’t feel guilty because that sounds defensive and that makes it sound like what you see in an interview about a hit-man or a mobster, someone who should feel guilty. How do I answer this question? I can’t answer the question until I’ve isolated some part of it that’s neutral. I don’t agree with the final premise of teaching people to lie. I don’t agree with the middle premise of feeling guilty about teaching people to lie. What is the reporter really asking me? “TJ, how do you feel about being in your profession?” Well, now it’s the easiest question in the world. “I feel great to be in a profession where I can teach other leaders how to communicate effectively to the world.” The reporter cannot quote any part of what I said, out of context, in a way it can make me look negative, stupid, or defensive. The reporter cannot claim I failed to answer the question. I completely protected myself. I’ve done absolutely no damage whatsoever. If I do get quoted on that, I don’t mind at all. That’s an example of the mindset change. Too many people have this adage, “Oh, these reporters. They’re always bothering me after the big game or the event. They’re stupid.” Not the point. The point is these people are giving you thousands of dollars, sometimes hundreds of thousands of millions of dollars worth of exposure to build your own personal brand, whether you want to be a network anchor one day, commentator, analyst, talk show host, or be a spokesman for a major national bank, international bank, or for a car dealership. It’s building your– Or run for politics. Here in the United States, many famous athletes use their fame when they run for a high-level office because it’s automatically worth several millions of dollars of branding ID. Many athletes toss this away. They just assume all reporters will always want to talk to you. When that day happens and your athletic career is over, unless you’ve built a great reputation for yourself– Most athletes are never interviewed again. Most athletes are not asked to speak. They’re not asked to give their opinions anywhere. It can be quite sad, especially given their intimate knowledge of their sport, their insights, and no one knows that they know how to share it. Anja: Would that be the most common mistake? TJ: The biggest thing is, athletes simply don’t realize how valuable this platform is. I’m sorry if this offends any athletes, but you are a part of the entertainment industry. It’s not just about the sheer excellence of your craft. It’s about doing it where TV can be involved, and TV commercials can be sold, and you’re in the advertisement business. I hate to tell you. If you’re at a high level and you’re making real money, you might as well understand you are in the media business. You might as well understand how it works. Take it seriously. Famously, in the United States, there are a couple of players who simply refuse to do the post-game interviews. This didn’t use to be the case, but now most professional sports have it written into everyone’s contract, you have to make yourself available to the news media for a set amount of time, immediately after the sporting event because, again, they realized the TV reporters, the radio reporters, they’re all essentially partners in this entertainment industry. Otherwise, you can go play in your backyard for free if it’s just about the joy of the game. In the media business, why not be good at it? The mistake people have is to get annoyed with reporters. Again, if you hear a question you don’t like, rewrite it to make it an easy question. This reporter’s honoring you essentially. They’re saying, “Hey, your so interesting, my audience wants to hear your ideas on stuff.” In any other circumstance, that’s considered flattery. Why not use it? Think of interesting things to say. Make time for reporters because, again, in the long run, you can make a lot more money as someone who can communicate effectively. Even if you don’t ever want to be a talk show host or a sports commentator, what does every coach have to do these days? They all have coaching shows. If it’s a major team sport like baseball, football, basketball, soccer around the world, most coaches have a part of their compensation package that they host a weekly show during their season. They have to be used to being on camera, interviewing people. At the college level, at least here in the United States where coaches are paid four, five, six million dollars a year, so much of their income is derived from the fact that they have to host TV shows and radio shows. It’s not enough to simply be a good coach. You have to talk about your sport and your game and how you did in many different ways, many different forms. Anja: I’m going to sum up all of your tips into maybe one big lesson which could be, try to go out now and record a presentation of yourself, a two, three-minute video that you can post on your own website or on your social media. You practice this and you watch yourself. You do it again and you watch yourself. When you’re satisfied, you actually have that piece of content for your website and you have done your homework. How’s that? TJ: Great summary. Another big tip I have for any athlete is, the second you’re athletic event is over, just pull out your cell phone. Do a Facebook live or YouTube video, giving your thoughts, your reflections on what happened today. Do that. Build your own following. Do that and you’ll build a reputation with reporters, writers, sports journalists so that they know they can come to you. Even if they didn’t get to interview you after the event, they’ll know they can pull that from your website. Very few people do that. Certain colleges, certain professional sports may have a limitation on that, but for others who don’t, for individual sports, you can start building your own media brand because, let’s face it, the career span of most professional athletes is short. The National Football League, the NFL, is famously derided as NFL stands for “Not For Long.” The average professional career is only three years. You can have a career speaking for the next 80 years. As long as you’re alive, you can speak. You can talk about your sport or perhaps coach your sport, and your expertise can benefit other people. That’s why it’s never too soon to learn how to be a better communicator. Anja: Thank you so much for this. Now, if people say, “I want to take this all the way. I would love to go work with TJ,” what are the possibilities? What can you give? TJ: Well, the best way is always to hire me for at least a full day or two full day. I come to you or you come to me in New York. I practice with you on video, again and again and again. Then I have a coaching program that sometimes lasts an entire year. If anyone’s interested in that, they can simply go to my website at mediatrainingworldwide.com and reach me there. I’m also on Twitter, @tjwalker. They can find me on Facebook and YouTube as well. That’s always the best way. The next best way, the easiest way, the least risky way is to click on the link that you provide (click here for this offer) . For the first 100 of your viewers and listeners, they’re going to get free access to my complete media training course. It’s more than 25 hours long. It’s far and away the longest, most comprehensive, most thorough online media training course in the entire world. Your viewers and listeners are going to get it for absolutely no charge. Anja: That is so generous of you. I advice you guys to take advantage of that because that’s an amazing offer! Thanks again. Thank you so much. I want to respect your time, TJ. I’m so happy you wanted to be part of the show and help all athletes become better on media.